When comes to cooking beans, IP is really ideal. Quick and the result is amazing. Thanks, Angie. Is it just me, or do the beans really taste better cooked in the IP? You eat bean w/bacon soup? Methought you were in the camp who would rather eschew than chew bacon. No? If not, what bacon do you buy? Whole Foods type cured? Just as many foods (lobster comes to mind) are an excuse to eat butter, bacon strikes me as an excuse to eat salt and grease. Take salt out of bacon, and I’m betting you could add chopped rubber bands to bean w/bacon soup and most people wouldn’t notice the difference. Sully, I buy only organic, pastured uncured bacon that is very meaty and is not greasy or salty. It adds a lovely flavor (and nothing bad) to my bean with bacon soup! The best bacon in the world comes from Denmark. Irish bacon is pretty good too. But for how much longer will we be able to obtain such bacon delights? The price of everything from Europe could skyrocket pretty soon for us. Perhaps just the beans on their own in the future. Nutritious stuff. I like the look of your instant pot, Jean. Very smart. Thank you, Cindy! And I'll check out your Pinterest! When I was a kid, my mother had some glass jars specially made for freezing. I foolishly gave those away. But I've found that my regular canning jars work just fine in the freezer. Thanks, Tony. The Instant Pot is proving far more useful than I had imagined it would. And it looks all right. Back in the day I would have made a gingham cosy for it--I made them for the toaster, blender, waffle iron. All my appliances looked very cute lined up on open shelving in their red and white gingham! But now I just leave them bare. I love Irish bacon, but I now have a more local source for good bacon, so rarely buy the imports. Yes, yes, yes! Pressure cooking beans is certainly my preferred way to cook them too and have been doing so for years. No more slimy caned beans, yuck. Your recipe looks similar to mine but I use chicky broth and a can of Trader Joes stewed tomatoes too. Thank you for doing the research on whether the beans split or not! I didn't know that and now if I want to keep my beans whole, release it sloooooowwww! Richard, unless I'm making refried beans or a thick bean soup, I want my beans whole, and that slow release makes all the difference. Sometimes I add broth, tomatoes, chiles or any number of other things, but this is The Basic Bean. I don't like canned beans either, so before I got the Instant Pot, I used the slow cooker. Thanks, Jan. I'm having fun with it! I don't have an Instapot so I'm living vicariously through you. Thanks for the visit. I'm not sure who came up with the "corset" name, but it's real. If you Google "corset teacup", you'll get lots of pretty teacups (many Aynsley). Margie, here I thought I just about knew it all when it comes to teaware! Just googled it and, yes, it's a "thing!" I wonder if the Canadian Instant Pot is more popular in the US than in Canada? I like your disclaimer about not posting IP recipes all the time. I feel the same way. I don't want to push it down reader's throats - but sure have fun using the IP. I have no idea what percentage of my readers own an IP. Anyway - I agree, there are some things that just taste better and beans are one of them. I truly love making pasta and risotto in mine - it somehow becomes magical in flavor. I personally look forward to more IP posts from you. Lea Ann, thank you so much. Appreciate your feedback, both as a blogger and cook. I have yet to try pasta or rice in it, but now I definitely will. Thank you for doing the research on cooking the perfect pot of beans in the IP, Jean! I will follow your advice in not pre-soaking them. I have tried hard cooked eggs in the IP, and was impressed by how well they turned out, too. Happy Spring! Jean, I don't own an IP although I do have a wonderful slow cooker. I know they're not the same thing. I don't remember ever having cooked pinto beans. They sound different than say, yellow-eyed beans which I love for baked beans. Your recipe sounds much more savoury and it intrigues me. Have a lovely weekend and Happy Spring! Thanks, csuhpat1. I'll be making another batch today. Thank you, Sandi. I really liked cooking beans in the slow cooker until I got the IP. I'm not familiar with yellow eye beans, so I just looked them up. Sounds like the perfect bean for baked beans or bean soup, things I use navy or great northern beans for. Maybe I'll order some! 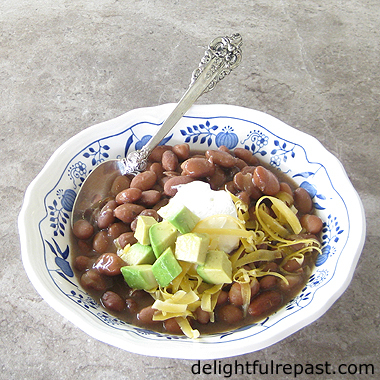 Pinto beans are entirely different, and I hope you'll give them a try. Hi Jean, I love using instant pot so fast and practical. Thanks for sharing this awesome and easy recipe for beans...and yes, great cooking extra for later. Enjoy the rest of your week...thanks for stopping by. I've never cooked dried beans because I was worried about the soaking and long cooking. I do like to use beans in recipes as it's a great way to eat loess meat. More and more I think an instant pot might be a good idea for me! Your Instant Pot Pinto Beans look really lovely, Jean. Thank you for sharing, and for being a part of the Hearth and Soul Link Party. I hope you have a lovely weekend! Thank you, Juliana. I always make more than I need of anything that can be frozen for future meals! Thank you, April. I didn't think my over-equipped kitchen really needed another appliance, but I've been using the IP rather a lot. 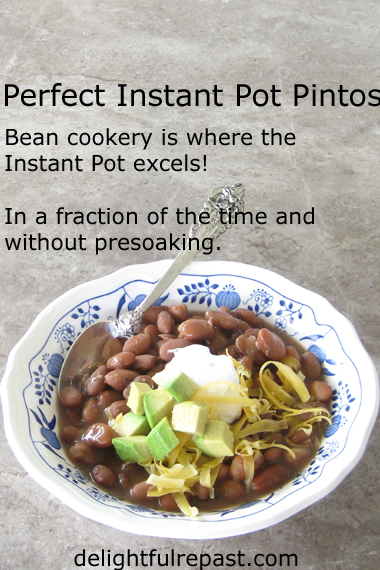 We eat a lot of beans, so maybe I do need an Instant Pot. When I think of pressure cooking, I always think about my mom's scary pressure cooker, but I realize that is not how they are now! I think you have convinced me that I need one! Pam, I was afraid of pressure cookers, too--and so was my mother. So it took me a long time to believe that the new electric pressure cookers are completely different. If I can do it, you can do it! Go for it! Zaa, sounds like it's high time for you to get one (AND to try pinto beans)! Enjoy! This sounds like an excellent way to cook beans. It's funny that you should say that pressure cooking forces flavour into the beans because it's pretty much exactly what my Indian friend says about the way he cooks lentils. I think that I'm starting to be convinced. I think I need to dust off my pressure cooker. Going to try this in my instant pot Love our beans. Found you on Traffic Jam Weekend Link Party. Maybe I have to buy an Instant pot to make all these wonderful recipes. Phil, thanks for commenting on that. I wasn't sure if that was correct, but it seemed sensible to me. Yes, dust off the pressure cooker. I'm sure you'll have fun with it. Thanks, Candy. Glad to find another bean fan! Aw, thank you, Gerlinde. I think we all need a new kitchen toy now and then to shake things up a bit! I like your scientific approach, Jean! I have only cooked beans the traditional way in the stovetop... and will continue as such. I never had a crock pot/slow,cooker and don’t imagine getting an IP! Thanks, David. I think it's just fine to continue your stovetop-only method--I like to keep things as simple as possible (for example, I will likely never have an air fryer). While I doubt I'll ever have an instant pot, they certainly sound as though they save a lot of time. Your pinto beans sound good...I haven't had them in ages. Thanks for the inspiration. These look so yummy! My brother and sister-in-law invited us over a few times to try out new recipes in their instant pot. Everything tasted delicious! I'm not sure if I'll buy one, but I love how everything tastes! 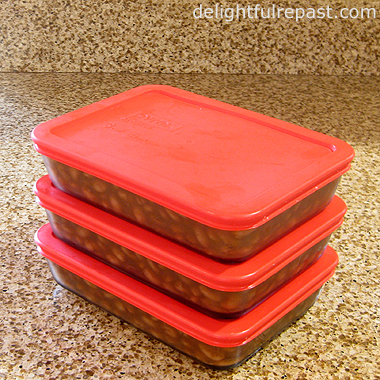 We love Pinto Beans they are a staple here at the cottage but I haven't tried them in the Instant Pot yet. I will sure have to give your recipe a try. 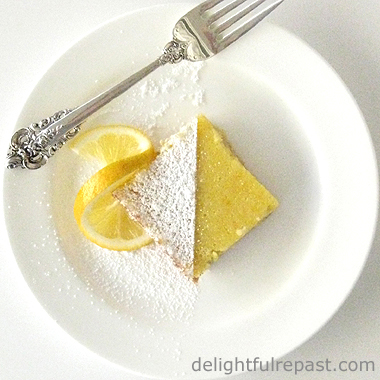 Thanks for sharing with us at Full Plate Thursday and have a good week! Ann, thank you. I toyed with the idea for several years before getting one! Thanks, Miz Helen! 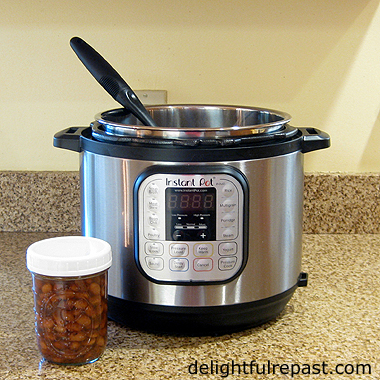 I think you'll find cooking beans in the Instant Pot pretty amazing! I grew up eating a lot of Pinto beans...being from the South! And I've heard about these cookers and I'm going to check it out. Maybe I DO need one! Thanks for the info and instructions on how you cooked these. Looks very yummy! Thanks, Diane. I think you could get a lot of use out of the IP. And it's kind of fun! We love beans, and eat them a lot. And often cook a big batch and freeze them in portion-size containers. Interesting that you find Instant Potted beans more flavorful than regular cooking methods. Makes me almost want to get an Instant Pot. Almost. :-) (Actually when my slow cooker dies -- which might take ages because I use it so little -- I'll probably get an IP). Really interesting post -- thanks. Thanks, John. Actually, the IP is the ideal replacement for your slow cooker, since it does both pressure AND SLOW cooking.